Caster Barn's 'LD' NYLON PEDAL TOTAL LOCKING Series swivel casters with 3 inch Polyurethane on Polyolefin core (PP) wheels feature a heat treated ball bearing raceway and a bright zinc plated finish. 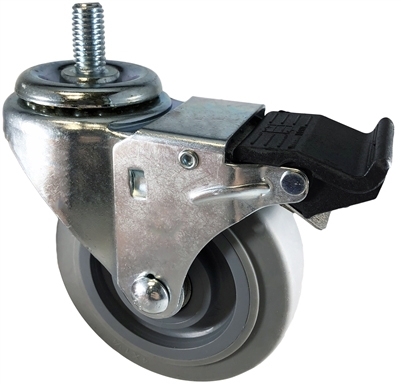 These casters are ideal for light and medium duty material handling, carts, equipment, and shop projects. Polyurethane wheels provide great protection for floors in commercial and industrial settings. Polyurethane on Polyolefin wheels feature an extreme resistance to water, oil, and grease. Being non-metallic, these polyurethane wheels are also spark proof. 300 lb capacity per caster.